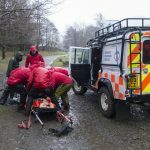 Incident Details: A family including two young children rang for assistance, when they became benighted and disoriented in mist on the summit of Cat Bells. 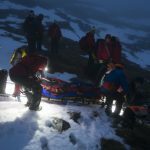 Initially they estimated their position as being above Black Crags on Maiden Moor, and the Team began to prepare for a search. However, they were able to respond to a SARLOC text, which pinpointed their position as being just off the north end of Cat Bells summit. They were not at all confident of their ability to descend with the two children down some slippery rock sections, so a small group of Team members went out to meet them and assist them down. They were met at the bottom by another Team vehicle which ferried them back to their accommodation. This incident might have been avoided by making an earlier start to the walk, and ensuring they had torches. 9 Team members – 2 hours 12 minutes.